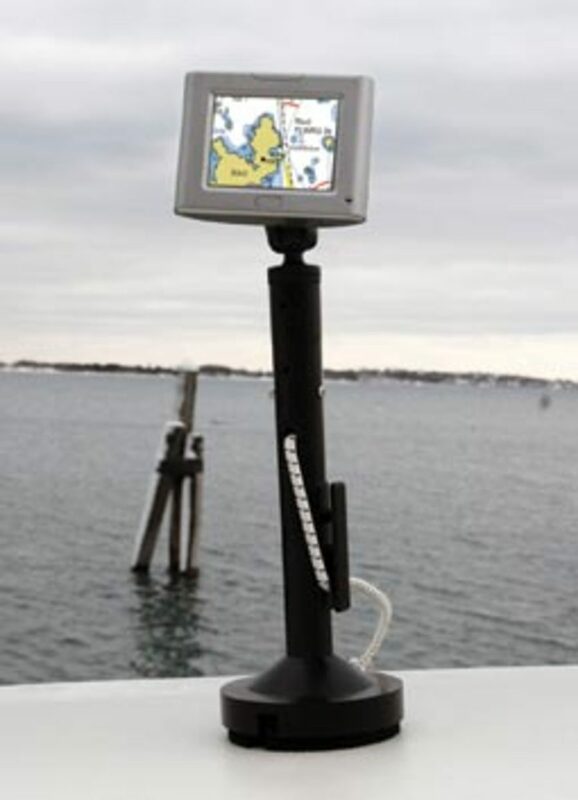 I&apos;m always looking for well-constructed, practical mounts for portable devices like a hand-held GPS or an MP3 player. 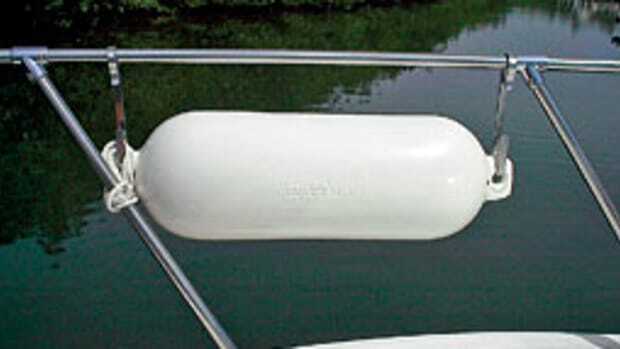 And then there is my search for a simple but sturdy mounting device for my inflatable tender&apos;s stern light. My searching ended with solutions from Kayalu, the outdoor products division of Boston-based SH Pierce & Company. Kayalu has adapted its single-point mounting system to address several scenarios. 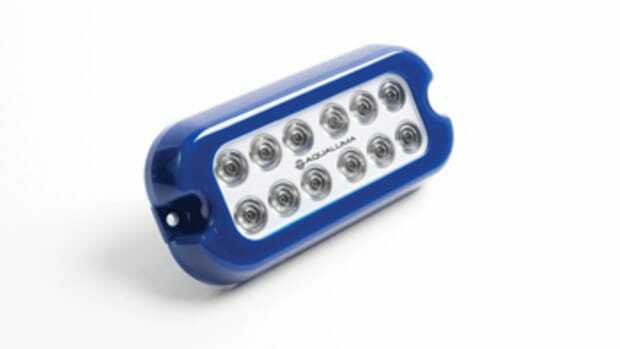 The Kayalite accepts a high-visibility LED that can serve as either a stern light, deck light or anchor light. It has proven popular with kayakers who paddle after dark. The company addressed the need to mount portable hand-held devices with its Kayaball, and it designed the Kayacam for mounting a compact camera or video recorder. All of these mounts share the same well-constructed single-point base that attaches quickly and easily. They are designed to tough standards while remaining affordable, according to Kayalu president Steve Hollinger. The design allows the mast to be easily secured to unsteady, inclined and irregular surfaces, and it overcomes the limitations of rigid-pole and suction-cup based lighting and mounting solutions. A tension cable holds the mast upright and prevents it from snapping back and forth or accidentally detaching. 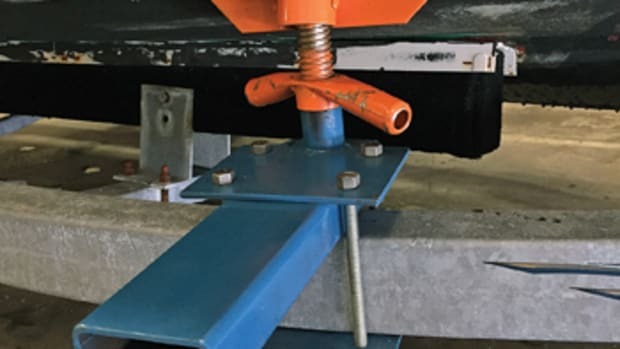 The patent-pending tensioning system is simple and effective. To use any of the mounts, clip the end of the bungee that runs out of the mast base to an existing eyelet or padeye (one can be easily installed) on your outboard cowling, dinghy seat, kayak or other surface. Place the mast base over the eyelet and then tension the bungee and secure it to the integral jamb cleat on the side of the mast. The 4-inch-diameter foam base adapts to contours and imperfections on the mounting surface and prevents scratches. The Kayaball uses a 1-inch-diameter RAM ball-and-socket mount capable of supporting RAM&apos;s line of cradles, holsters and waterproof containers for electronic gear. The RAM mounting system offers position flexibility and ease of use. 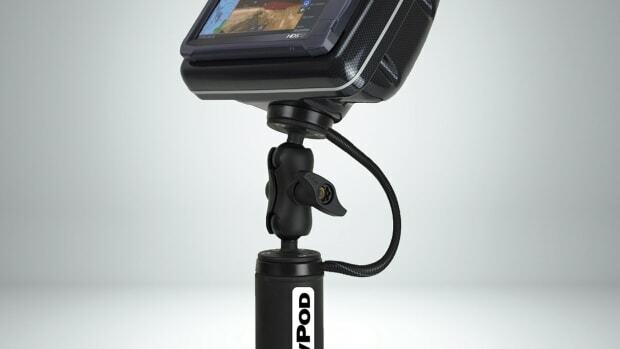 The Kayacam also incorporates the RAM system for mounting your own camera. 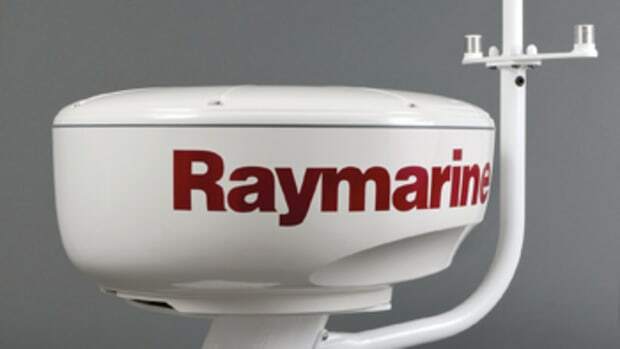 The Kayalite includes a Tektite Mark III industrial marker light that is bolted to the base using a marine-grade stainless machine screw and matching stainless nylon-insert locknut (300 series, corrosion-resistant). The overall height of the Kayalite is 18 inches. The mount that all three of these products employ is constructed of textured black ABS. An easily overlooked but important design feature is the curved tube running through the mast that protects the bungee cord from chafe. The Kayaball and Kayalite retail for $39.95, while the Kayacam retails for $49.95. At the time of this writing, the products were only available directly from Kayalu. 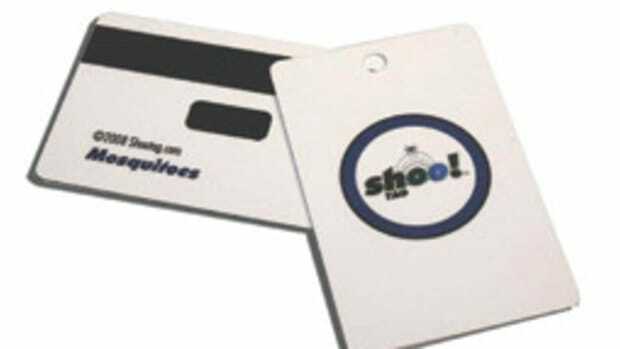 Visit the company Web site at www.kayalu.com or call (617) 338-2222. One of the basic requirements of a water rescue is self-protection. The four steps for rescuing someone in the water are 1) call for help, 2) protect yourself, 3) stabilize the victim and 4) retrieve the victim. The Mustang Water Rescue Kit provides the tools for the last three of those steps. Packed within the bright-yellow military-tough, waterproof Hardigg Storm Case are a PFD, Rescue Stick and Throw Bag. The Mustang belt pack inflatable PFD should take care of protecting yourself. It is manually inflated by either pulling the ripcord or using the oral inflation tube. The "stabilize" step is accomplished with the Rescue Stick, which is designed to be easily and accurately thrown to a victim. Seconds after it hits the water, the 1-pound, 16-inch wand automatically inflates into a large horseshoe float with handles, stabilizing the victim with his or her head above water. A stabilized, calm person can more confidently aid in the rescue. A CO2 cartridge automatically inflates the Rescue Stick, but it also can be activated by pulling the ripcord or using the oral inflator tube. With 35 pounds of buoyancy, the Rescue Stick can provide emergency flotation to multiple victims. It can be repacked and rearmed for additional use. 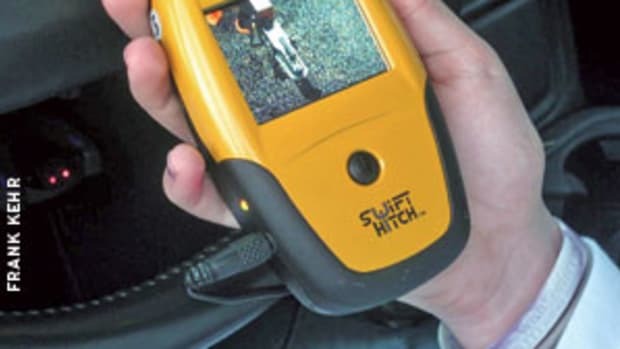 The Rescue Stick has two U.S. patents. The Throw Bag is used to retrieve the victim. The Throw Bag consists of a heavy-duty buoyant bag with 50 feet of floating rope. Hold the loose end of the rope in your off hand and the rope-filled bag in your throwing hand. Throw the bag beyond the person in the water and slowly pull the rope. The victim grabs the rope and is brought back to the boat. For me, tossing the bag underhand like a softball is most accurate, though it takes a bit of practice. 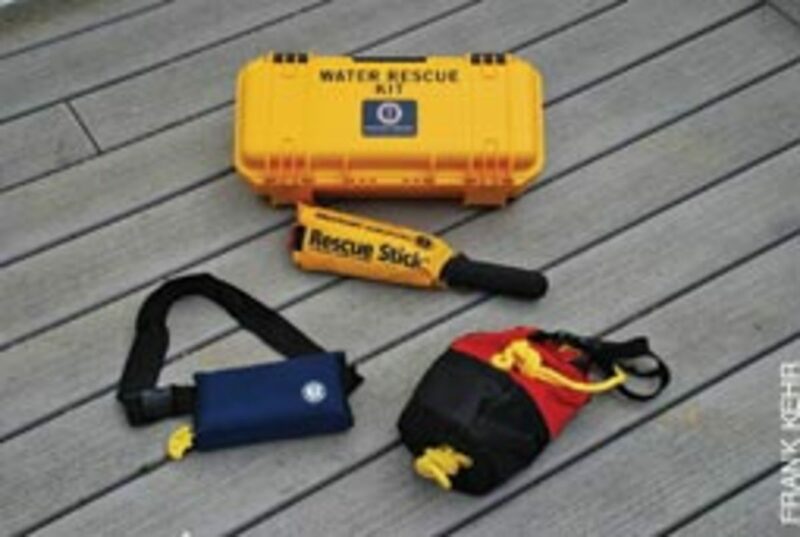 The Water Rescue Kit is easily taken aboard even the smallest boat, with the waterproof Storm Case keeping the contents together, dry and accessible. I&apos;ve added a few flares and a portable VHF to my kit and I even use it in my tender. The throw bag is also good insurance for tossing a line to a hand at a crowded dinghy dock. Online retail prices vary, but are generally in the $400 to $500 range. For information, visit www.mustangsurvival.com.